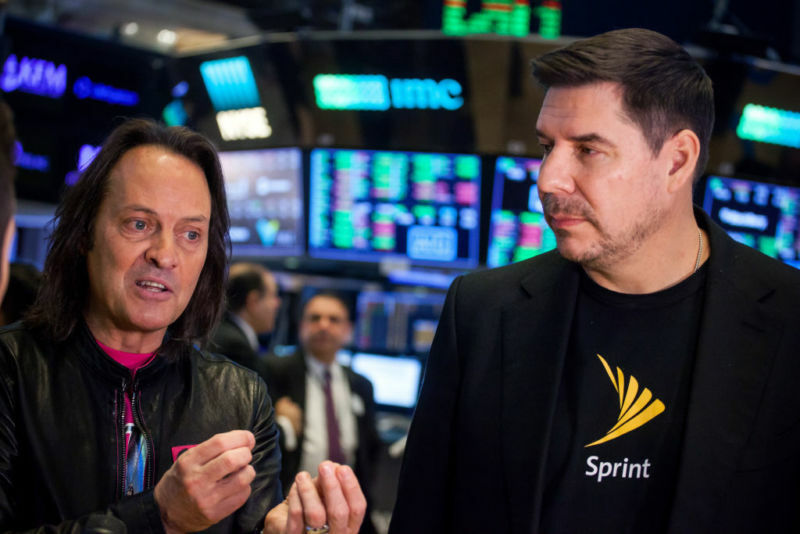 T-Mobile CEO John Legere (left) and then-Sprint CEO Marcelo Claure during an interview on the floor of the New York Stock Exchange on April 30, 2018. DOJ staffers “have told T-Mobile US and Sprint that their planned merger is unlikely to be approved as currently structured,” The Wall Street Journal reported today, citing people familiar with the matter. “In a meeting earlier this month, Justice Department staff members laid out their concerns with the all-stock deal and questioned the companies’ arguments that the combination would produce important efficiencies for the merged firm,” the Journal wrote. DOJ staffers’ recommendations aren’t the final word at the agency. The department’s antitrust chief, Makan Delrahim, would decide whether to challenge or allow the merger. Sprint and T-Mobile declined to comment further when contacted by Ars. The DOJ generally doesn’t comment publicly on ongoing merger reviews. The Justice Department’s antitrust division is reviewing the merger and could file a lawsuit in federal court in an attempt to block the deal. Success isn’t guaranteed, a fact the DOJ was reminded of when a US District Court judge allowed AT&T to buy Time Warner despite DOJ opposition. The DOJ could also approve the merger with conditions, but that would require agreement with T-Mobile and Sprint on what those conditions would be. “T-Mobile and Sprint could offer concessions, such as assets sales, to address the government’s concerns,” the Journal wrote. Sprint shares “are trading at a roughly 20 percent discount to the price implied by the all-stock deal, signaling Wall Street doubts about the combination’s chances,” the report also said. T-Mobile has spent at least $195,000 at President Trump’s hotel in Washington, DC while lobbying for Trump administration approval of the merger. The T-Mobile/Sprint deal would reduce the number of nationwide mobile carriers from four to three, limiting customer choice across the United States. T-Mobile and Sprint are smaller players in a market led by Verizon and AT&T, but T-Mobile has surged in recent years by offering more customer-friendly deals than the two biggest carriers. T-Mobile and Sprint began their merger push a year ago by claiming that neither company could build a robust 5G network while operating alone. But the companies’ own previous statements about their 5G plans contradicted those claims, and government officials don’t appear to be impressed by the 5G argument. T-Mobile unveiled an in-home Internet service last month, while claiming that it can only expand it significantly if the government approves the merger. The Federal Communications Commission is also reviewing the deal and hasn’t said whether it will approve it. Besides the federal agencies, states are reviewing the merger and could sue to block it even without DOJ help. “The different groups of government officials are operating on similar timelines and a final decision is still likely several weeks away,” the Journal wrote.